Deliver a great meal or buffet and your guests will be talking about your event for months. Deliver a poor quality one and yes, they’ll still be talking about it, but for all the wrong reasons. So what should you be looking for when it comes to choosing a great caterer? Is it price, availability, quality or quantity? Chefs and caterers can get carried away with their own brilliance, and, for 5 star restaurants, this is perfectly fine and to be expected. But this is your event. Your needs are top priority and if they do not recognise this then go on to the next company. The caterer that actually listens to you, wants to sit down, spend some time with you and work out a menu that suits your event and your guests is going to come up with something really special. Things to look out for when hiring is – are they asking you a lot of questions, they will want to know the purpose of the event, the budget, the guests and dietary requirements. This is down to your common sense, rather than the caterer. When choosing a caterer, don’t expect someone who specialises in fine dining to be able to manage a barn dance barbeque. Likewise, someone who is used to casual outdoors picnics will struggle with a posh, sit down wedding banquet. So, if it is not clear on their website, ask the important questions. You know what us Brits are like, we don’t want to make a fuss, and this is true when it comes to asking for samples. We see it as being too forward and making more work for the caterer. But caterers are used to providing samples, it is how they get the majority of their business. And don’t just ask one, get a few that you like the look of. Ask them all to provide samples and then you make your choice. Remember, they are trying to get your business so make them work for it! You’d be surprised the amount of clients that fall flat at the last hurdle, which is the contract. It is that British attitude again. Don’t expect freebies to be handed over. You should get everything you want on the day to be on that contract, that way you are covered. So start from the top, as in canapes, how many, what flavours etc., then move onto starters, how many types and for how many guests and work through the whole menu. Most caterers have liability insurance, if yours doesn’t then this is a huge red flag and we would recommend going elsewhere. Liability insurance covers the caterer for anything that goes wrong, and this means at least you will get a payment. There’s nothing better than personal recommendations, so have a look at previous clients and see what the feedback is like. If you can go to independent sites all the better. 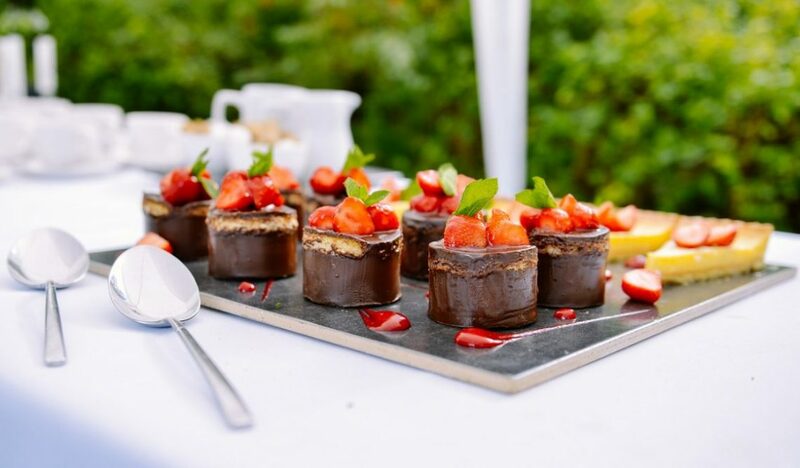 A legitimate caterer will have lots of pictures up on their website with names and the date of the event, as they are proud to showcase their work. The right caterer will be passionate about their food and will want to delight and surprise you on the day. Their staff will be smart and professional and eager to help make your special day a success. And if you do find a great caterer, try and make it easier for the next person by posting good feedback. If you need any catering equipment for your event, please take a look at our catering equipment hire page.